* The weekly metro pass runs Monday-Sunday, not 7 days from purchase. Oops. * The subway is every 5-10 minutes from like 5am to 1am. Beats Boston or even some NYC lines. The buses, though... I was deceived by staying near the 24, which does run every 10 minutes until 9pm, but most other lines seem more like 20-30 minutes. * Supermarkets seem scarce, though I did find one today. (A proper one. Google Maps calls various things "supermarkets" that are lame corner/convenience stores.) It has many varieties of brie and Camembert for sale. Lots of smaller stores, quality ranging from "seriously meh" to "ooh, nice produce!" * Apparently no whole milk, just 0, 1, 2, and 3.25% fat. * Yogurt without gelatin! ...not as good as TJ/Strauss "European style". I may try "Balkan style" after I finish this one. * Montreal has Uber and no Lyft, and no UberPool. I'm told Toronto has Lyft, I forget if it has Pool. * My front door is literally flanked by maple trees. Obvious: many more lines, more frequently. Lots of different car types, none with a simple printed line map as are universal in Boston cars. Some did have an electronic line map that shows where you are and where you're going -- very nice, if you're in the right place to see it. I never noticed the announcers announcing the wrong station, as is ubiquitous on the Boston red line. Fares: in Boston, it takes 5 round trips for a 7 day pass to pay for itself, or 4 if you're comparing to using CharlieTickets instead of CharlieCards. For a monthly pass, 19 or 16 round trips. In NY a 7 day pass needs 6 round trips, and a 30 day pass 22. Also, the 7 day pass expires at midnight, whereas Boston passes are timed so you get a full 24x7 hours from first use. Technically that's tomorrow, but I'm just getting put on a bus. Well, putting myself on a bus. Anyway, today is my last full day this trip. And it started out sucking! Loud party nearby, vibrating my room to 4:30am. So that was a thing. I figured I would go to the Met, but when I got to Central Park, the day was *perfect*. I decided the Met is always there while the weather will be changing (sometime...) and I should enjoy the outdoors. 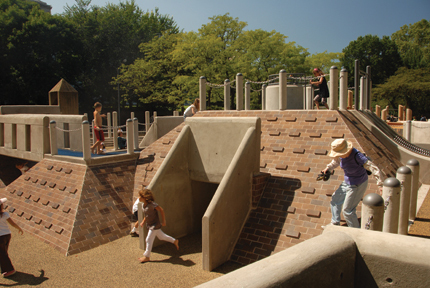 There's an Ancient Playground, which is basically a playgound in "ancient" style. I would have taken a photo but I was self-conscious of photographing lots of kids. And it's easier to link to someone's else's photo anyway. Central Park keeps confusing me. Lots of twisty paths, few maps, and the maps don't show you where you are on the map. At least the Ramble Path ones don't. Anyway, I did have fun, but it was annoying too. So, next. I grew up reading Calvin Trillin's food humor essays, in which he extols Katz's Deli, and Russ and Daughters. He was writing in the 1970s but these are still around! Or things with their names are, anyway. Russ was closed but I went to Katz. It's big! And busy! And... expensive! $23 for a pastrami sandwich! I don't know if their pastrami is supposed to be that good and expensive -- and their roast beef, and their bologna -- or if they're just milking popularity. I let myself be milked. It was... okay. I'd be hard pressed to imagine a sandwich that I could agree was worth $23 -- wagyu beef, maybe. I'm not sure this was even the best pastrami I've ever had. It was different, almost like chunks of beef, vs. thin sheets or basically shredded. And there was a lot of it. But, eh. It came with two kinds of pickles, I assume the small dark tasty one was kosher dill, don't know about the bigger bright green one. Oh right. Outside the Met I'd had a hot dog from one of the ubiquitous food stands. Then I saw a Nathan's stand so had a Nathan's dog, plus fries. The hot dog was definitely different -- thinner, firmer, different flavor. Maybe better. The fries were bland and almost wet inside. What I really miss getting to is the Bronx Botanical Garden. But it's like 1.5 hours from where I'm staying -- or an hour via some Harlem train that runs once and hour -- and I didn't feel I left home early enough to make the trek worth it. There are so many little deli/convenience stores near each other, sometimes 2 or 3 on one short block. Weird. Also the supermarkets are either one-off or small chains I don't recognize: Associated, Key, City Fresh. Met DW:conuly a three days ago, that was fun. Explored Bedford area of Queens, and south Brooklyn, took the south Brooklyn ferry north and saw the Statue of Liberty, far off like a little action figure. Nighttime perspective was weird, it *felt* closer. Otherwise been working, haven't seen much. There's a nice Japanese restaurant right across from me, with cheap lunch specials -- even cheaper because the price includes sales tax! When I first walked in it was playing "Auld Lang Syne", which is what Japanese stores play at closing time. Wednesday is "suggested admission" day, which probably increased the crowds; that's why I was there! Some things like gorillas and butterflies you need a full ticket for -- *that* was discounted too, down to $15, but I figured there would be enough free material to fill my 3.5 hours, since I left home late. The Pere David were a soft spot for me. A childhood book was Gerald Durrell's A Bevy of Beasts, and I dimly recall the story of the finding of the Pere David, and of him trying to nurse a deer or something during his apprenticeship at Whipsnade. Deer usually aren't very exciting for me but it was nice to see these, and read about the zoo breeding them, and in fact there were a whole lot, lying together in a pile. Got a glimpse of a tiger. Hyenas and elephants AWOL. Distant view of African wild dogs, which looked pretty big. Also lions are thugs, stealing from hyenas and wild dogs. A placard claimed lions would steal a dog kill in 8 minutes, which sounds implausibly precise, and that a whole pack of hyenas can't stop a male lion, which matches a video I saw, though in that the hyenas were poaching the lion cubs. Getting to the zoo was supposed to be 1.5 hours and ended up being longer. After exploring the area for food, I found a faster way back, the 5 instead of the 2. I ended up staying until City Hall; no food there but a busy pathway which turned out to be the Brooklyn Bridge. I walked it to say I had, got to Brooklyn, saw nothing, and took a train back. is huuuuge I was there for 3-4 hours and feel like I barely scratched it. Went through the ocean hall, some forest halls, and some Asian Peoples halls. Some neat exhibits on forest microclimates, and various cultures. OTOH lights were often out, and many placards have terrible text contrast even in bright light. My lease with Psycho Killer Cat is up, and I chose not to seek a new one, for reasons like "want to travel more" and "fear committing to another lease with a startup job". So I'm back to the Airbnb migration I was doing for six months last year. It'll probably be harder now, as various cities have been cracking down; certainly Cambridge and Somerville rooms seem a lot scarcer now, though I was also looking last minute at a busy period. OTOH, I'm aiming to actually travel this time, with two weeks in NYC next week. So far I've stayed a couple days in North Arlington, and currently Watertown a mile west of the square. Both were quiet and sleepy, apart from yardwork. Arlington did have a reservoir and the Great Meadow nearby. NY will be in Queens. Lots of Lime (dockless) bikes in Arlington and Watertown; my first attempt was pretty negative though, as the seat kept collapsing under me, which is a *really* unpleasant feeling: pain and ache up through my right inside (like, not the skin muscles, but further in.) I poked at a bike in Watertown, which seemed more stable, but chickened out of renting it. After a couple of visits, I wasn't expecting surprises from Glendale, but that was foolish of me. On Monday I went on one of my walks, soaking up sunlight and enjoying a close hill to walk up, heading toward streets I knew climbed up while still have sidewalks. After a while having done so without water bottle seemed foolish, but I found myself close enough to push on to the Brand Library -- "currently open" on Google Maps -- where at least there'd be water, and supposedly some park. Inside I find a library with the expected bathrooms and water fountains, but also extensive art galleries featuring the work of various artist collectives. When I was done with that, and paid more attention to the collection, I found nothing but art and music books. Turns out it had been the mansion/ranch of Brand, who held parties you had to fly in to attend. The property was donated to Glendale on the condition of retaining an art focus, and so we find a public library branch that's devoted to the arts. There was also a teeny tiny Japanese garden (free!) on the property, along with some doctor's Victorian house that had been transplanted there, and roads up into "wilderness area". As a bonus, when I finally left, I took a different route, that happened to take me to the "Kenneth Village" I'd seen hinted at on directional signs. Nothing *too* special, just a little cluster of shops and restaurants, but as northern Glendale is pretty thoroughly residential, it was a nice surprise too. I had an awesome conversation with some girl I was sitting next to, though she never wrote me back afterwards. One of my first photos with a new camera was of another cute girl across the aisle (I asked permission.) One time I sat next to a vet who had a pet ferret in his backpack. I didn't ask where it crapped. It was neat stepping out in or near Salt Lake City and seeing the mountains there. Heading west to Spokane I encountered my first dry electrical storm, not having ever heard of such a thing. It was really creepy: no rain, no sound, not even many visible lightning bolts, just the sky flashing frequently. I had crazy thoughts about Canadian nuclear barrage or something. Montana really is Big Sky Country and it gives me the willies. Some line not far west of the Mississippi river separates "not enough rain for many trees" and "trees will grow unless actively suppressed". This first became obvious when I woke up in Arkansas, going east, and Surprise! Trees! outside the window. If you're north enough there are trees in the west again, but they're stands if not plantations of conifers and really boring. Inbound, I'd noticed signs at Chile's immigration advertising their use of antimicrobial copper. Outbound, I think I actually found the use: the desk area in front of the agents looked like copper. I'm not sure how useful that is, but I guess it won't accumulate germs from the papers of the person in front of you, and the agent's hands might get cleaned resting on the copper. Chile continues to be a model of efficiency for customs. There's a dozen or two agents, and a single line, with numbers and sounds telling the head of the line which agent is free. Very fast. Chile isn't always efficient, often not, but they're great at this. Unlike JFK's two agents for US citizens, one line per agent, and slow. Probably because apparently even dual citizens get fingerprinted, at least if they wave their other passport around. Being a US citizen doesn't save you from being treated like a criminal. Santiago's security claims "no liquids" now, but they don't actually notice/care about a half-liter of water in my duffel. US flights still have agents between the gate and plane, confiscating such bottles. The replacement bottle cost $4.40 from Hudson's in JFK. Geez! JFK's security was like half an hour long. And still having shoes off and laptops out, unlike my last two Logan experiences. OTOH, gotta like the abundant plugs at the gates. Just one side of this wall has four plugs, 3 USB ports, and two Qi circles. My actual gate, 2, has a low and dark ceiling; I'm hiding out in gate 5 which has high arched ceilings. CNN is hosting two women arguing about family leave and Obamacare. White Republican talking about Obamacare "killing family business", black woman calling her on it. I just noticed: in addition to the TV, there's an even bigger and eye level LCD display just carrying ads. I'd managed not to notice until now, in part due to being on my laptop, but yeesh. Welcome to America, land of ads everywhere.